The highlighted comments are mine. Context: This is a mustard I once bought on impulse. I loved it. But then I couldn’t find it again, so I went on their website and began calling and/or visiting all the Toronto stores they listed. No luck. I placed orders for it at Pusateri’s and a ritzy Rosedale specialty grocery store. No one even got back to me to say they couldn’t get it. Finally, I decided to write to the company. Here’s what happened. Message: I’m going crazy trying to find your Jalapeño Mustard. I’ve even tried ordering it from Summerhill Market in Rosedale and from Pusateri’s in Bayview Village and no one has gotten back to me. 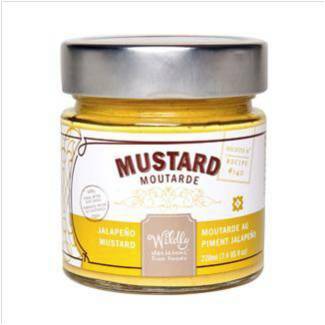 Unfortunately, I was not able to find a retailer in Toronto that sells our Jalapeno Mustard. And it’s currently out of stock here in our factory. Sorry about that. I can’t believe that’s the best reply you could come up. The first question I asked was if the product had been discontinued and you never answered that. HAS it been discontinued? If so, I’ll stop looking for it in stores and stop emailing you about it. And whether or not it’s been discontinued, where IS it available currently: what cities and what stores? Maybe I could go there or have friends pick some up for me. Thank you for your assistance XXXXXX, but as I explained to you I am absolutely crazy for this mustard. I am willing to go great lengths. XXXXX did note that the product is on b/o; unfortunately we do not have an ETA at this time. Thanks for the additional information but why would I thank XXXXX for her assistance? She didn’t give me any, nor did she say the product was on back order. She merely said you were out of stock. She offered no alternative action. Her email was a dead end. And I’m sorry to disappoint you for not enthusing like a 14-year-old on Twitter in my reply to her. Women my age don’t write breathless emails. As for your reply, it was the bare minimum in terms of helpfulness. What cities are these stores in? You know what—never mind. I’ll continue making my own jalapeño mustard. It tastes exactly like yours—and it’s a lot less work than exchanging emails with you and XXXXX. I apologize for the lack of information. I certainly did not mean to upset you. We do appreciate the loyalty of our customers. We were unable to find anything in Toronto and most of these locations are great distances. I wish I could give you more information; however we do not have more to give at this time. We are having trouble getting one of the ingredients for the mustard. I have a case of Jalapeno Mustard. You can come by and pick up a couple of jars …. It expires at the end of March. Will that work for you? Forget it. You’ve lost me as a customer. My Perspective: My friends final comment to me sums up this experience perfectly. In a few short emails, the company turned a passionate customer into a highly vocal critic. Rather than telling friends about the great product she had discovered and helping Wildly Delicious grow their business, instead she will tell the story of the poor customer experience — probably many more times.